Are you struggling to figure out what to do with your career? 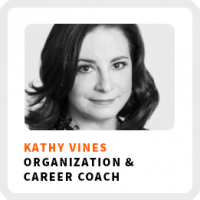 Kathy Vines shares how to find your purpose by purging your life. If you know me at all, you know talking about purging is one of my favorite topics! Kathy gave me permission to really geek out on it! She’s the owner and CEO of Clever Girl Organizing. She helps people get more productive by helping them get better organized. Never forget anything again by creating systems and by putting fail-safes in place. When something annoys you more than twice in your life, do something about it. How she reinvented her career after laying herself off after 20 years working in HR. Why she’s fine with making less money working for herself than being paid more to work on stuff that caused her stress. Purge your life to discover your true story. Wake up time: Typically around 7:00am. Core work activities + habits: 1) Maintaining her CRM. 2) Improving her pitch for her speaking business. 3) Improve her Quickbooks knowledge. Ideal work environment: Whenever and wherever clients are ready to work and, when it comes to working on her business, in the late morning from about 10:00am-1:00pm. Superpower: Being able to cut underneath the response that people think is their answer to something. Favorite productivity tool: Amazon Echo. 90-day goal: Complete transition to her new platform. 1) Starting with things you aren’t very emotionally attached to, typically items in your kitchen. 2) Using the momentum from your initial purge to gradually build your purging ability like a muscle before tackling bigger, more emotional areas like your closet.